Meet Buck from TeamCerf on Vimeo. The game I've been working on since August has finally been revealed on the cover of Game Informer. If you don't know about game informer, it's kind of a big deal to get the cover, haha!! I'm so excited! in the article about the game and Crystal Dynamics, there's even a couple stills from shots that I've worked on (page 46, top center, when you get the mag). I can't reveal any images from the mag until it's released, so I'll have to wait to show them. Just so everyone knows, this game IS NOT fully motion captured, so if you read that anywhere, it's not true. Nowadays (not always though), the big cinematic moments are the only things motion captured; it can vary though. I can't say a lot about what's been released until the magazines are actually out, but the animators, and everyone here has worked really hard on this game, and I wouldn't want anything taking that away. This is amazing, I'm so happy to be a part of this great game! I'll have to read through everything to see what I can say about the game. The Windows to our Soul! I thougth this was pretty cool. I think every Animator should have this. 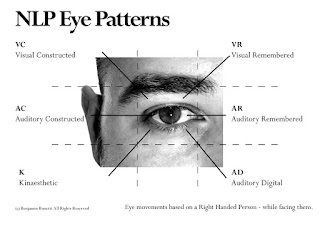 It's a chart showing our Eye patterns during thought. There's a video showing this in action! So, here's a shot I've been working on over the past 2 weeks or so off and on (due to my work schedule). Right now, I'm just refining the body, and preparing to move on to lip sync, and polishing after that. I looked at my reference a lot for this to make sure I had key things and the timing I was aiming for. I changed some gestures a bit, because some things didn't work well with the character, IMO. I hope this turns out how it does in my head, lol. New Shot I'm going to animate soon! Here's some reference I shot for an acting test I plan to do soon. I'm gonna tackle a pantomime shot first though. I thought this was pretty cool. I really like the style. In the Beginning from Katie Wendt on Vimeo. Rowan Atkinson acts out what to do and what NOT to do on a date. I'm a pretty picky person about some things, and character rigs are one of them! It's always so hard for me to find a really GOOD character rig. I imagine that some other animators out there, be them experienced, or beginners, run in to the same thing. I personally won't go for a rig if the model isn't appealing, specifically in the face and hands. I don't care what cool controls it has, I feel like a bad design can really hurt your animation... That's just me though, lol. For the rig itself, what I look for is pretty simple: Flexibility in the face, IK/FK switching (I'll settle if it doesn't have matching, no biggy), stretchy limbs, good believable deformation, and nice hand controls (I like to be able to control the fingers myself, and not have them automated). So, this brings me to my point! I feel like to get what you want, the best thing you can do is either learn how to do it yourself (Which I prefer), or find a good rigger, through a LOT of research, so you don't waste your money, lol... If you don't want to learn how to do these things yourself, can't pay someone, or don't know anyone who can do it as a favor, I recommend this AMAZING tool!! It's not THAT expensive either! Of course you'd need a character model though. The Face Machine, and The Set Up machine!! We used this tool when I worked at Lightstream Animation Studios, and I really liked the flexibility I could get in the face. It's not perfect of course, but it's a quick way of getting really good results, with not a lot of effort. Click the images to see some cool videos demonstrating the tool.Visit the website and check out the other videos. Here's a short film where the characters were rigged using these tools! So, I've told some co-workers and past classmates that I'd create a blog, and now I have! My plans for this is to share my thoughts on Animation (Sometimes other topics), share helpful tips that I've learned, share updates about my current personal work, where and what I'm working on in the industry (if I'm allowed to say), and share anything cool I find and feel the need to post. I hope that people can get something out of this. Also, I hope to try and post something every week or so. Sometimes more often, and sometimes less, depending on the time I have. I'm an Animator at Pixar Animation Studios. I'm constantly pushing to learn things about life, animation, and filmmaking, which keeps it interesting! Keep Growing!